Gastronomy is the study of food and culture, with a particular focus on gourmet cuisine. One who is well versed in gastronomy is called a gastronome, while a gastronomist is one who unites theory and practice in the study of gastronomy. Italian cuisine has developed through centuries of social and political changes, with roots as far back in antiquity. Significant changes occurred with the discovery of the New World and the introduction of potatoes, tomatoes, bell peppers and maize, now central to the cuisine but not introduced in quantity until the 18th century. Italian cuisine is noted for its regional diversity, abundance of difference in taste, and it is probably the most popular in the world, with influences abroad. Italian cuisine is characterized by its simplicity, with many dishes having only four to eight ingredients. Italian cooks rely chiefly on the quality of the ingredients rather than on elaborate preparation. Ingredients and dishes vary by region. Many dishes that were once regional, however, have proliferated with variations throughout the country. Cheese and wine are a major part of the cuisine, with many variations and Denominazione di origine controllata (DOC) (regulated appellation) laws. Coffee, specifically espresso, has become important in Italian cuisine. Taste the traditions of our lake and mountains, try the ancient recipes of Lake Maggiore and the Ossola, have a 5-star cookery lesson, indulge in some of the highest level gourmet experiences, delight your palate with our local gastronomy and our quality DOC Piedmontese wines. We can arrange the best events and tours for foodies, wine enthusiasts or those in search of qualità cookery lessons, all integrated into a multi-sensorial, free-time experience on Lake Maggiore. Cooking class after a gastronomic visit, ask us for a tailor made offer. The Piedmont region is a place of traditions, history, centuries-old recipes and delicious specialties. Each province offers the tastiest of dishes prepared with products from this rich land. Piedmont cooking should be explored by making a journey in discovery of tastes – a universe of a thousand colours and flavours to be enjoyed with excellent wines that enhance the flavours of this oldest of culinary traditions. This region can lay claim to excellent wines famous throughout the world: smooth reds, whites with golden tones, dessert wines and wines to linger over with pleasant conversation. For to the lovers of the fish, delicious occasions on the Lake Maggiore. Beginning from the perch, a fish that is symbol of the lake: in order to go back to its origins it is necessary to go until Mesopotamia and on the Nile Delta. Already the Egyptians inserted it in their cooking, appreciating his tender and delicate meat. In the restaurants of the Lake it is served in fillets or as an ingredient of the risotto. Other species among which bleaks, trouts, tenches, carps, pikes and whitefishes. In the numerous restaurants of the lacustrine area you could taste these fishes cooked in different ways. The gastronomy offered in the area surrounding the Lago Maggiore is delicious and varied and bring together the tastes of the lake and the Alps. Local products not to be missed include cheese, cured meets, frogs, rice, honey and cakes and biscuits. To satisfy all those who like to eat good food the territory boasts 17 Michelin starred restaurants as well as plenty of other great places to eat, including the area’s many conference and event venues. As a main course why not try some of the regions fresh fish or special cured meats such as the mortadella of the Ossola, the raw ham and violini di capra of the Vigezzo Valley. Locally produced wines will complement these meats perfectly. If you are looking for something a little different frogs are a specialty in the Bassa and are considered one of the most refined foods of the region. Between the Alps and the Po valley, with a large number of different ecosystems, this region offers the most refined and varied cuisine of the Italian peninsula. 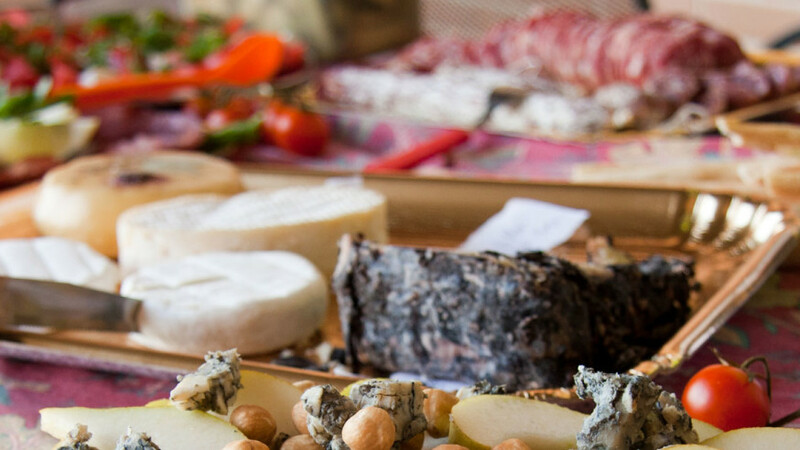 Point of union of traditional Italian and French cuisine, Piedmont is the Italian region with the largest number of cheeses Protected Geographical Status and wines Denominazione di origine controllata. It is also the region where both Slow Food association and the most prestigious school of Italian cooking, the University of Gastronomic Sciences, were founded. Piedmont is a region where gathering nuts, mushrooms, cardoons and hunting and fishing takes place. Truffles, garlic, seasonal vegetables, cheese and rice are all used. Wines from the Nebbiolo grape such as Barolo and Barbaresco are produced as well as wines from the Barbera grape, fine sparkling wines, and the sweet, lightly sparkling, Moscato d’Asti. The region is also famous for its Vermouth and Ratafia production. Castelmagno is a prized cheese of the region. Piedmont is also famous for the quality of its Carrù beef (particularly famous for its fair of the “Bue Grasso”, Fat Ox), hence the tradition of eating raw meat seasoned with garlic oil, lemon and salt the famous Carpaccio, the famous Brasato al vino, wine stew made from marinated beef, and boiled beef served with various sauces. The food most typical of the Piedmont tradition are its traditional agnolotti (pasta folded over with a roast beef meat and vegetable stuffing), Panissa (a typical dish of Vercelli, a kind of risotto with Arborio rice or Maratelli rice, the typical kind of Saluggia beans, onion, Barbera wine, lard, salami, salt and pepper), taglierini (thinner version of tagliatelle), bagna cauda (sauce of garlic, anchovies, olive oil and butter) and bicerin (hot drink made of coffee, chocolate and whole milk). Finally Piedmont is one of the Italian capitals of pastry and chocolate in particular, with products like Nutella, gianduiotto and marron glacé that are famous worldwide. Risotto alla milanese with saffron. The regional cuisine of Lombardy is heavily based upon ingredients like maize, rice, beef, pork, butter, and lard. Rice dishes are very popular in this region, often found in soups as well as risotto. The best-known version is risotto alla milanese, flavoured with saffron and typically served with many typical Milanese main courses, such as ossobuco alla milanese (cross-cut veal shanks braised with vegetables, white wine and broth) and cotoletta alla milanese (a fried cutlet similar to Wiener schnitzel, but cooked “bone-in”). Other regional specialities include cassoeula (a typical winter dish prepared with cabbage and pork), Cremona’s Mostarda (rich condiment made with candied fruit and a mustard flavoured syrup), Valtellina’s Bresaola (air-dried salted beef) and Pizzoccheri (a flat ribbon pasta, made with 80% buckwheat flour and 20% wheat flour cooked along with greens, cubed potatoes and layered with pieces of Valtellina Casera cheese) and Mantua’s tortelli di zucca (ravioli with pumpkin filling) accompanied by melted butter and followed by turkey stuffed with chicken or other stewed meats. Regional cheeses include Robiola, Crescenza, Taleggio, Gorgonzola and Grana Padano (the plains of central and southern Lombardy allow intensive cattle-raising). Polenta is generally common across the region. Regional desserts include the famous panettone Christmas cake (sweet bread with candied orange, citron, and lemon zest, as well as raisins, which are added dry and not soaked).